FYFY also provides clear and concise directives for advancement for those individuals in direct sales associations like Tupperware and Mary Kay as independent business owners, career counseling center attendees, non-profits that serve neighborhoods in transition, parts of the education for non-profits that serve at-risk populations, detention centers and prison inmates, homeless shelter residents and even for entrepreneurial start-up programs. 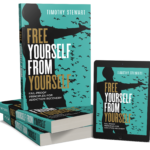 The Free Yourself From Yourself book and 8 Step Training Programs target a wide range of demographics including people who are searching for answers of how to overcome the fear and pain of remaining the same or those who are determined to be successful even if they have not yet experienced a major setback in life. Free Yourself From Yourself shared a post.